Every train operating on the TRR requires a clearance. 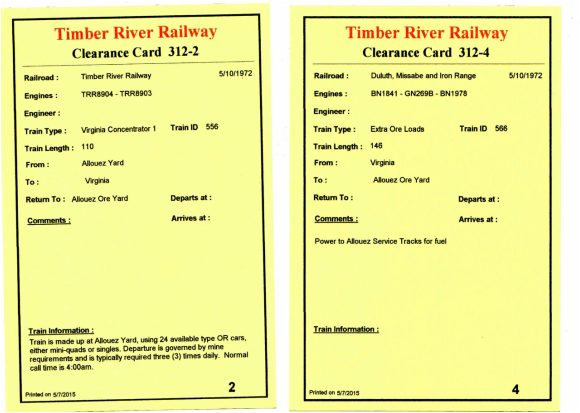 Samples of typical Clearance Cards are pictured below. Engineers are also issued Switch Lists for the train they are operating. 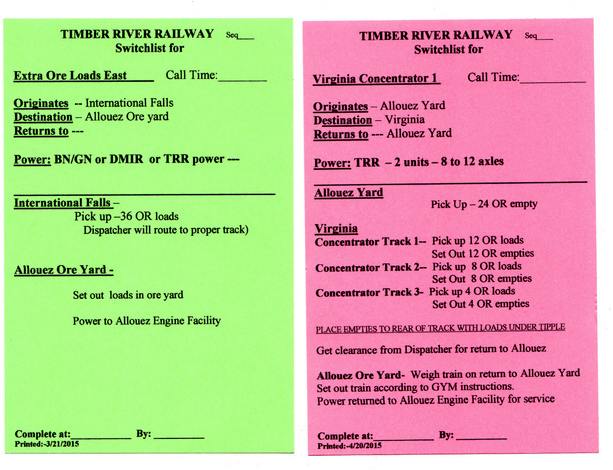 Green list is a typical through train from staging to the Allouez ore yard. Crew weighs the cars on arrival Allouez. Crew then spots the train as directed in the ore yard and then takes the power to the large service facility for fuel and inspection. Pink list is a typical mine run that operates from the Allouez yard to a mine. The crew picks up their power at the engine facility, picks up their train, arrives at the mine, sets out empties and picks up loads. It then returns to the Allouez ore yard, weighs the loads and spots them in the ore yard as directed. Power is returned to the facility for service.